Our Jewelry Making workshops are a great activity for all ages and a great way to spend creative time with friends and family. The workshops are taking place at our Jewelry Gallery which includes unique collection of custom designer jewelry from different countries, and it will be supervised by our skilled instructors. 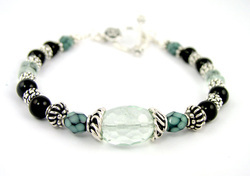 Choose from a huge variety of gemstone beads and design your own unique bracelet, anklet or necklace. A short talk about stones and basic jewelry creation by implementing your birthstone colors. Designing and finishing a necklace & earrings or bracelet & earring using leather, cotton cord and stretch magic. Bring your old unwanted piece of jewelry and design something new and stylish for you or your friends! Make your own 4th of July jewelry! 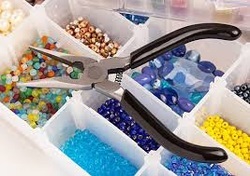 Get ready for the 4th of July by making your own bracelet, necklace or a pair of earrings. Don't be afraid to tackle this project if you don't have much beading experience. This project is great for beginners! We will provide wine, snacks and beads for you! Bring a friend and create some fabulous jewelry!